Can the World's Fisheries Survive Our Appetites? On film, many a desert-island castaway has put a message in a bottle and cast it out to sea, hoping it would someday reach land. Sorry, all you modern-day Robinson Crusoes, try that with a plastic bottle in real life, and your message will probably end up in the middle of the Pacific Ocean, bobbing in a floating collection of trash known as the Plastic Vortex. It's an accumulation of plastic debris swept into the Pacific  whether directly from beaches or flowing out of rivers  and carried by equatorial currents into a swirling pattern to one spot between Hawaii and the mainland U.S. Plastic bags, plastic bottles, plastic toys  even last year's Crocs  end up in the shifting vortex, which some scientists estimate to be twice the size of Texas. And as plastic use increases, especially in rapidly growing developing nations on the western end of the Pacific, that vortex will continue to grow. "It's huge," notes Doug Woodring, an entrepreneur and ocean conservationist in Hong Kong. But "unfortunately the ocean is a big place, and once it's out of sight, it's out of mind." Woodring is trying to change that. With help from the Scripps Institution of Oceanography, Woodring and several colleagues in ocean conservation are launching a two-ship expedition to the plastic vortex to explore it, take photographs and video and alert the public about the growing threat of ocean waste. "We need to make people realize what we are doing to our ocean," says Woodring. On Aug. 2 and 4, two ships  the New Horizon from Scripps in San Diego, and the Kaisei from San Francisco  will depart from California for nearly monthlong missions to the vortex. The New Horizon will focus on scientific research, looking at the impact of the plastic vortex on marine life in the Pacific. As the plastic bakes in the sun, it slowly breaks down, leaching toxic chemicals into the water that may harm fish  and eventually us, when we eat them. The Kaisei  the word means "ocean planet" in Japanese  will experiment with ways to clean up the debris without harming marine life in and around the vortex. People will be able to observe the progress of the mission from the project's website, which should offer one of the first up-close views of the biggest trash heap in the world. The Pacific vortex isn't the only one. The Atlantic and Indian oceans, which have different current patterns, have plastic gyres of their own. Since these massive hoards of plastic come to float in international waters  and the vortices are far from land  no government is willing to take on the expense and difficulty of cleaning them up. The best solution is simply to stop adding to them by using less plastic and recycling it when we do. 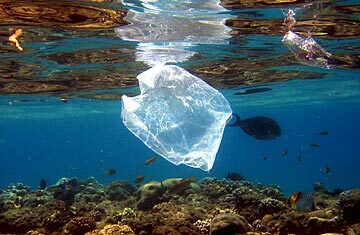 Currently, more than 60 billion tons of plastic are produced each year, and less than 5% of that is ever recycled. Much of what doesn't end up in landfills finds its way eventually into the great plastic vortex. Woodring hopes that Project Kaisei will awaken people to the fact that the plastic they throw in the garbage doesn't just disappear. "Anyone who has ever been on the beach and seen plastic debris can understand this," he says. "This isn't like glacial melting or tropical deforestation, which might not be in your home territory. This is something that everyone can see and touch and make a difference." Follow Bryan's reporting at TIME's Going Green forum.